It’s a journey I should have taken long ago but, what can I tell you, I’m not a travellin’ kinda guy. Sherron and I have been talking this over for some time, debating the pluses and minuses of a road trip so we could take copies of my novel So Dark the Night around to bookstores and beg, threaten and/or bribe them into stocking it. It took some work but Sher finally convinced me we had to do whatever was necessary to get the book somewhere it’s going to get noticed, start some buzz. I did some research and identified around 10 bookstores, many of them indie, in Calgary & Edmonton that would be a good fit for So Dark the Night. I have to say, the booksellers in Calgary and Edmonton treated us with exemplary courtesy and respect. They always listened to my pitch with patience and a fairly convincing display of attentiveness. We made some great sales and contacts and even the places that didn’t take the book outright asked for either a sample copy to look over or a promo flier (which we just happened to have on hand). Certain bookstores and staffs stand out: the folks at Pages, in Calgary’s Kensington district, and the dudes at Greenwood’s Bookshoppe in Edmonton. Liz Janzen at the stunning Chapters/Indigo store on Whyte Ave. in Edmonton (Liz, I could’ve chatted with you all day)…book lovers and enthusiasts, trying to keep the printed word alive and vibrant. I salute you and I hope you sell gazillions of copies of So Dark the Night. But the trip wasn’t all business. July 28th marked our 20th wedding anniversary and Sherron and I celebrated in fine style at a luvly cabin just outside Jasper (a place called Pine Bungalows). Lots of wildlife…including roaming elk and the resort’s mascot, a chubby white cat Sherron dubbed Harold. Harold found us one night as we were star-gazing and hung around until we returned to our cabin. 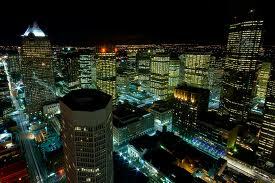 On the way to Edmonton, we picked up our son Sam, who had been attending film camp with his crony and collaborator Sean. The two of them shot and edited (they’d completed the script ahead of time) a 20-minute short about a botched caper called “Newton’s Cradle” that is smashing. Look for it on YouTube—or over at their blog—one day soon (they’re going to give it a final tweak before releasing it). Fantastic job, guys. Of course, visiting so many bookstores I couldn’t resist picking up a few titles for my personal library: Wandering Star by Nobel Prize winner J.M.G. Le Clezio; Wonderful World by Javier Calvo; Already Dead by Denis Johnson and Andrew Collins’ Where Did It All Go Right? One of the high points of the trip was buying a new hat, a Barmah, made in Australia and built for abuse. Found it in a store at Lake Louise while we were waiting out a downpour and Sherron twisted my arm until I bought it. Okay, I exaggerate slightly. I threw a fit in the store and screamed until she gave in and said I could have it. Not quite accurate but a lot closer to the truth than the first version. It was a marvelous trip and that is entirely to Sherron’s credit. I’m more than a trifle agoraphobic and the idea of being away from home for any length of time fills me with dread and foreboding. But Sher made this trip fun and stress-free and I have to say I enjoyed being away from my desk for a few days, taking a breather and soaking up the beauty of our Rocky Mountains. I feel better, re-charged and back in balance. New projects beckon and a good chunk of the summer is gone. Time to get refocussed and into a good groove. Busy times ahead. Happy anniversary! And I hope you sell a ton of books! I’m interested in getting a Barmah. No one seems to have them! Which one did you get, and where in Louise did you ever find it? There’s a little mall, right near the Chateau, and one of the stores specializes in Australian gear. 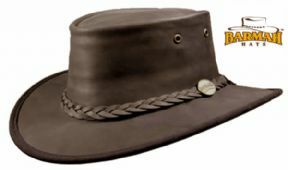 What material for your hat, leather or kangaroo? Your choice. Sherron and I were sitting on the deck, admiring the view of Lake Louise, sipping over-priced drinks, when a storm blew up and chased us inside. We found the Aussie store, I tried on the hat and, well, I was smitten. That storm doesn’t materialize, I probably wouldn’t own my Barmah. End of story. Hope you find the hat. Probably Chateau Mountain Sports. Thanks for the lead!